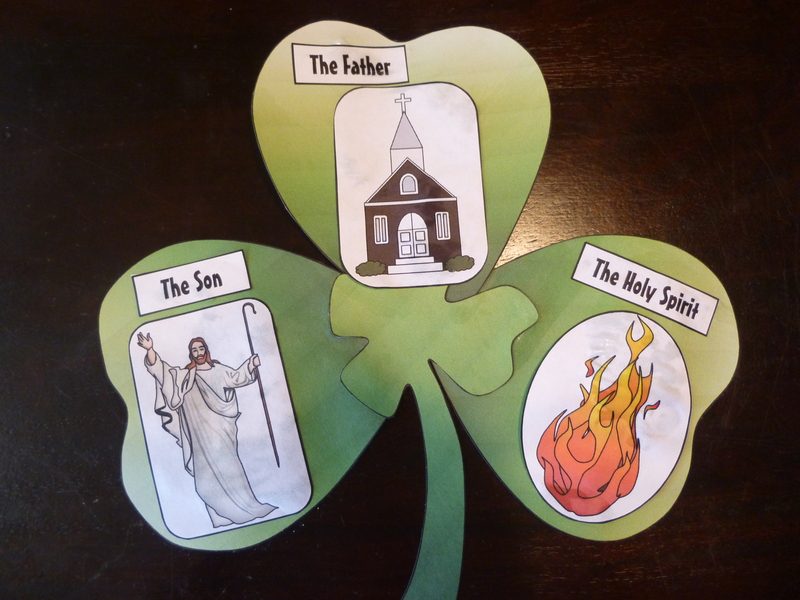 Of course the shamrock is perfect for talking about the trinity (just ask St. Patrick) so I wanted to do an activity with the girls. 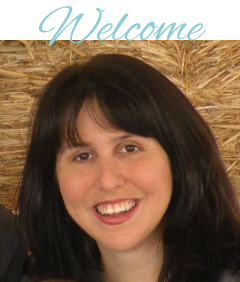 I couldn’t find one that I really like–many had just the words (which my girls can’t read yet) or I wasn’t fond of the pictures–so I had my husband design this one for us. During the gluing (I had to do most of the cutting), we talked about what the words and pictures meant and how God, Jesus, and the Holy Spirit (a very hard concept for them) are separate but the same. I printed the shamrock pieces on cardstock and then the inner images on regular paper so that it was sturdy but not too heavy. With St. Patrick’s Day coming up we spent some time talking about St. Patrick and that saints are people who love God very, very much. We also used it to do a lot of math and counting activities. I actually had a few more things planned but my little leprechauns got so into counting their gold that we didn’t get to everything. 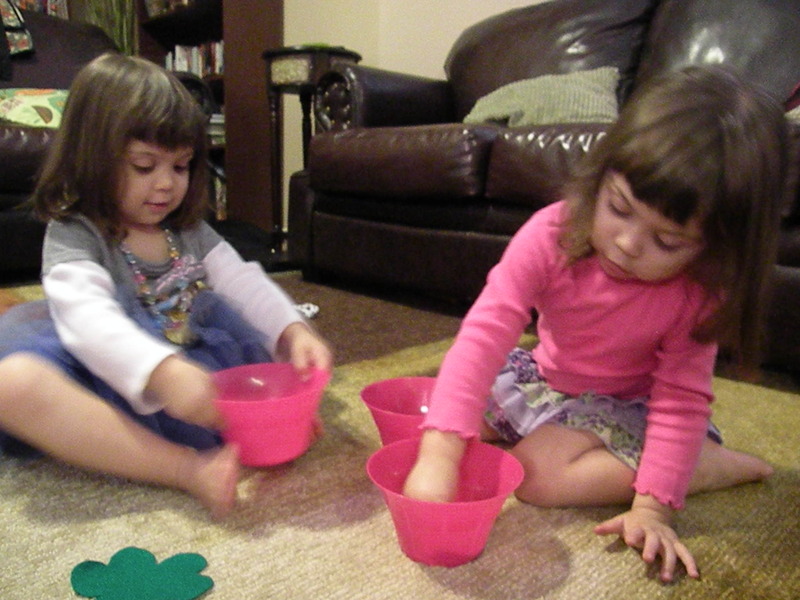 Little leprechaun pots of gold seemed like a perfect way to practice counting. 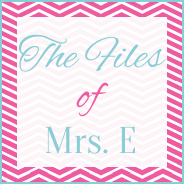 This was the first file folder game I’ve made all on my own (well, to be honest, that my husband designed and I put together). Usually I find others online but I couldn’t find one that I really liked. 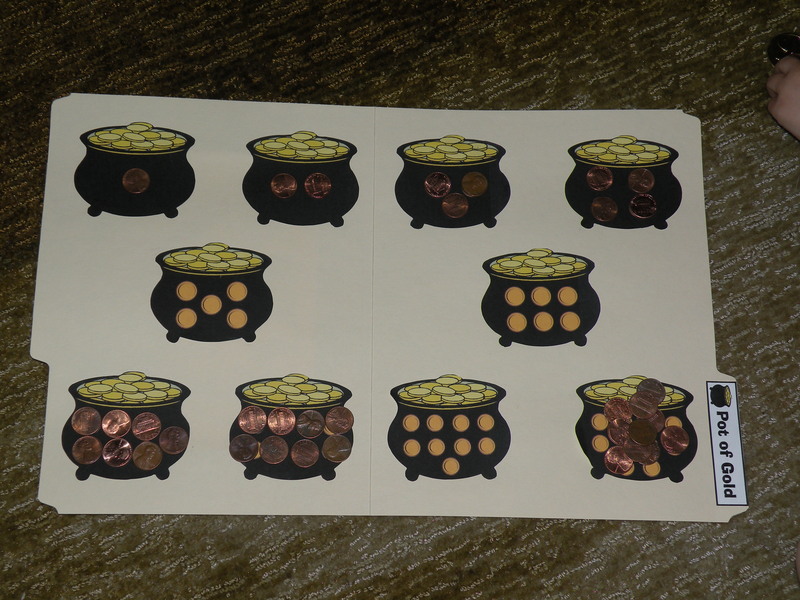 We’re focused on counting and not as much the number symbols so instead of matching the leprechauns with the numbers on them, we just counted out pennies for each pot of gold. 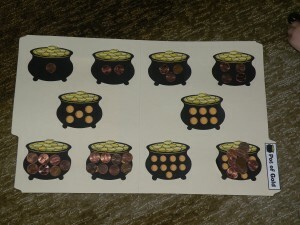 For my girls at this age, it probably would have worked even better had I put each pot of gold on separate notecards, instead of the file folder with all of them, since they became a little overwhelmed with all the pennies. 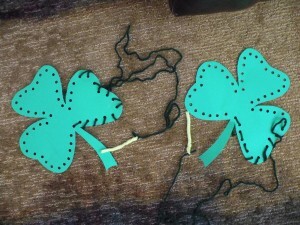 But now I have it ready for next year when it will be easier and they can also match the little number leprechauns. Apparently Mia became a little leprechaun because she kept grabbing the bowl of pennies and saying “My pot of gold!” 🙂 We ended up getting out two more bowls and practiced counting out pennies into their own bowls and then building towers with the pennies. St. Patrick lived a long time ago (wave back with your hand) and far away (wave far off) in Ireland. Ireland is across the ocean (make waves with hands) with rolling hills (draw hills with hand). 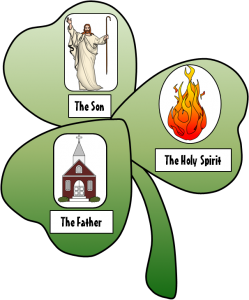 St. Patrick loved (cross hands over chest) God (point up) very much. He loved (cross chest) God (point up) so much that he wanted to tell everyone about God (wave pointed finger like talking to someone). He told everyone in Ireland how much God (point up) loves (cross chest)us (point to self). 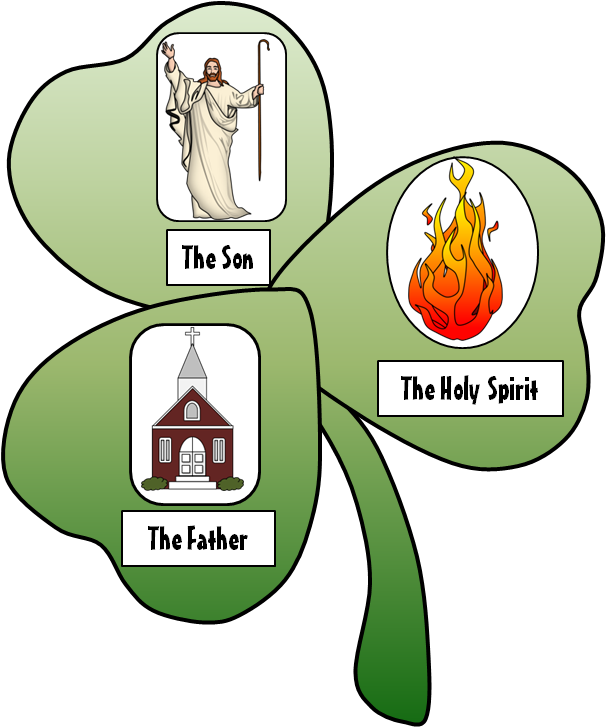 St. Patrick loved (cross chest) God (point up) so much that he could do special things. Ireland had lots of snakes (wiggle like a snack and stick out your tongue). The snakes (wiggle) were scary. St. Patrick loved (cross chest) God (point up) so much that God (point up) helped him get rid of the snakes (wiggle). St. Patrick said “Go away snakes!” (shout “Go away snakes!”) and the snakes (wiggle) went away. St. Patrick knew God (point up) could help him do anything. 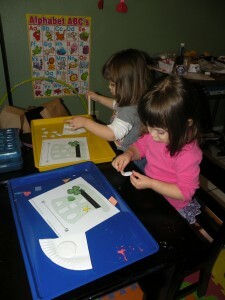 I really liked this Shamrock felt board story from preschooleducation.com. I’ve been trying to get away from the 5 little whatevers for each holiday but I really liked this one because it was a little different. The girls also really taking the pieces off of the board and this one forced them to take turns. (Child’s name) picked one, and that left four. Four little shamrocks, green as they can be. (Child’s name) picked one and that left three. Three little shamrocks playing peek-a-boo. (Child’s name) picked one and that left two. Two little shamrocks nodding in the sun. (Child’s name) picked one, and that left one. One little shamrock for St. Patrick’s Day fun. I just cut out Shamrocks out of green posterboard and then punched holes along the edge for the girls to lace yarn through. To make it easier I attached a little “needle” made out of a pipe cleaner. Since we had sewn the mittens before, we experimented a little with different stitches.